Based on hydrodynamic properties and the special models needed for the description of bacterial growth, carbon removal and oxygen consumption, activated sludge reactors can be divided into three groups: (a) nearly completely mixed tank reactors (Fig. 6.13a), (b) nearly completely mixed tank reactor cascades (Fig. 6.13b) and (c) tube flow reactors with axial dispersion (Fig. 6.13c). Fig. 6.13 Standard activated sludge systems. (a) Completely mixed tank reactors. (b) Closed tanks in series, frequently used for pure oxygen. (c) Flow tube reactor with diminishing aeration intensity. tions are typically not performed. As a result, considerable deviations from the CSTR occasionally exist. In Fig. 6.14, two special types of these reactors are shown: a Bio-Hochreaktor for the treatment of industrial effluents with a height of 20-24 m (Fig. 6.14a) and a Putox-Belebungsanlage for the treatment of municipal wastewater from small housing areas, which is built into the ground (Fig. 6.14b). Tank reactors connected in series have frequently been used for "pure oxygen WWTPs". The greatest interest was often not the reduction of the degree of mixing, but the more efficient utilization of oxygen. 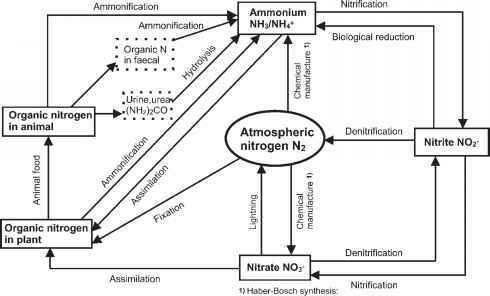 Therefore, the waste gas of the first stage (O2, N2, CO2) is dispersed again to take advantage of the relatively high residual oxygen concentration. 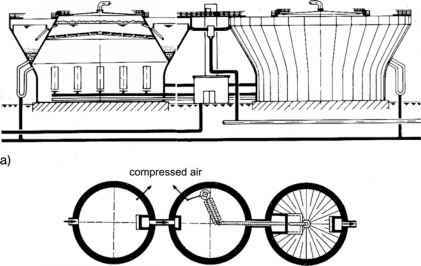 Normally, cascades with three or four stages are operated; and both the wastewater and the gas flow in the same direction, resulting in a high removal rate in the first stage and a low removal rate in the last stage, where only a small decrease in BOD5 occurs (see Fig. 6.13b). Fig. 6.14 Special types of completely mixed tank reactors in technical scale. (a) Bio-Hochreaktor for the treatment of high-load effluents (Hoechst AG; Leistner et al. 1979). (b) Putox-Belebungsanlage for domestic effluents (5-1500 inhabitants) (Purator, Vienna). 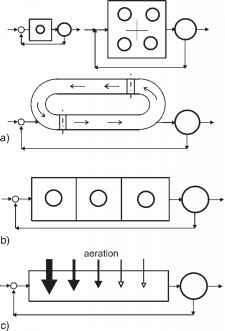 Tube flow reactors, in contrast, are open systems (Fig. 6.13c). They typically have a length of up to 300 m and are constructed in a meandering form to make better use of the available area and to reduce pipe lengths for sludge return lines. A pressurized aeration system is often used (porous ceramics or membranes) and the number of the aerators per basin area is changed from higher values near the wastewater influent to lower values near the effluent.